Brown walnut framed by artist (This piece is virtually unique): $6,500. Alternate unframed prints from: $850. This photograph was shot in 1994, the last season of the Durham Bulls in Durham Athletic Park. 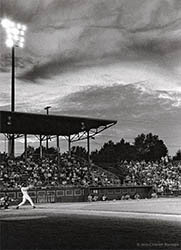 That summer and spring I covered the entire season of home games as I had fallen in love with Durham Athletic park and its kitsch, rather well portrayed in Bull Durham. This series is called Hit Bull, Win Stack, and is the subject of a book whose narrative is written by Clyde Edgerton and is seeking a publisher. This print is “mordanced” which means that a rare chemical treatment was applied to the print, post processing, and results in the silver content being brought up, resulting in a 3D-like effect. Archdiocese and Monastery: 918 Carolina Avenue, Durham, NC 27705. Jean-Christian Rostagni: 919 416 1111 Anytime on Appointment.